This week saw the group just hanging out and chatting for the evening. With a couple of us getting there later than usual, we didn't try to squeeze in a game and run the risk of staying out too late. It can be tough to get up the next morning and trudge off to work after staying up into the wee hours. That being said, we did cover a couple things. The upcoming Blood Angels Codex. 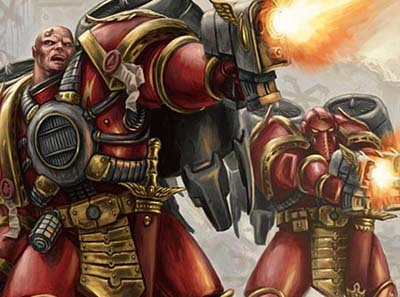 There have been a couple of "leaked" versions, but it looks like the boys in red will be getting the same attention that the Space Wolves did. How their rules will turn out in the end, who knows... I'm just happy they appear to have gotten a good once over and they look to have lots of life breathed into their new book. No, I'm not playing Chaos, but the other Old Timers seem to believe the Dark Angels are really just Chaos with an Imperial paint scheme. It hurts that they don't have faith in the Emperor like I do. Me... I find myself increasingly frustrated and disappointed with the lack of (I even lack the word to describe what I'm talking about) the current Dark Angles Codex has. Don't get me wrong, I love the Dark Angels, I just wish the Codex matched the rich background for these guys. At first, it didn't bother me, but now it does. 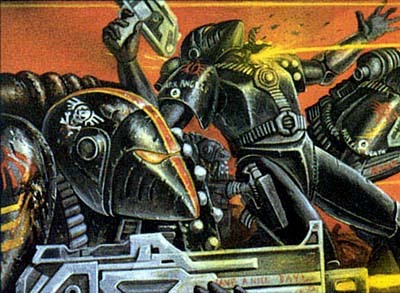 The more I read about them and get into the history of these guys, I look at the Codex and I realize it does absolutely no justice in really portraying the chapter. So... knowing that I only play for fun against close friends these days (meaning not competitively or in any type of tournament) I'm going back to the previous Codex. I'm going to use it to add the elements back in that I think make the Chapter what it is. More to come on this, I promise. Im with you there, the latest codex does not have as much pernash as any of the other ones that came before this one, i think the DA players have been screwd. But the DA have so many ways that they can go in a broad sense. Deathwing, Ravenwing, plain old DA brotherhood....these newer codices are characterized by the vast amount of characterful heroes you can field. The SW have at least 6 heroes with lots of fun rules, and the leaked BA codex mirrors that as well. Heck, even the vanilla marines have 9 special characters that can make really divergent formations. I think that all the DA need is a real taste for what they should be. How much does Hunt the Fallen affect a game for the DA? I know that the SW requirement for two HQ's really makes for some intriguing builds, and tactics. I just see the DA needing more spice! Ron....why do you still cling to your faith in a false god? The Emperor eliminated religion on Terra and taught "knowledge" not faith. All of the chapters should know this, but alas....they have lost their way. Humanity is doomed to a slow death. Rick: That hurts. You're just jealous. I know what you mean by this Ron. I was never happy with the way they handled Harlequins in the new Eldar Codex. Sure, we got them, but it just doesn't have the flavor that they deserve. I used to play around with the old Citadel Journal lists and figured out what I could do. Maybe a good time to look back at them and see about playing some games. Also, thanks for putting up the Aftermath link! I've started doing some reverse linking on there back to member blogs. Cheers.